This quiet cantonment town has suddenly shot into prominence with the arrest of Punjab Public Service Commission, chief Ravinderpal Singh Sidhu, who is constructing a house here. A scrutiny of the Cantonment records reveal that the controversial Masonic Lodge was registered way back in September 1902. The new initiative taken by the health authorities to involve voluntary organisations in the upkeep of hospitals will go a long way in improving the quality of services and the overall environment of the hospitals. The veteran Congress leader, Mr J.B.L. Khachi, was given a state funeral at his native village of Ghamana in the Kumarsein area of the district today. The Kangra police has launched a massive hunt for a Briton, Joel Kitchen, who has been missing for the past five days ever since he took off with other paragliders from Billing near Baijnath. The Kulu police today seized 20 kg of charas from two foreign nationals who were moving suspiciously in the Patlikuhl area near Manali. A patrolling party deployed at a camping site got suspicious about the activities of Robert Williams and Ivor Ftelcher, both British nationals, and searched them. The Board of Governors of Regional Engineering College, Hamirpur, today gave its approval to converting the college into a deemed university. The Himachal Pradesh government has decided to fill 2165 vacant posts of teacher by recruiting vidya upasaks and JBTs. Enraged over the inordinate delay in starting the work on the tribal students hostel project, members of the Himachal Pradesh University Tribal Students Association today demolished the foundation stone of the project laid by Mr Murli Manohar Joshi, Union Minister for Human Resource Development, on the campus about two years ago. It was a day of happiness for the residents of Himmatpur Dawli, a locality of this town, when they saw a number of vultures converging on a carcass of a buffalo dumped in a nullah near the locality. This quiet cantonment town has suddenly shot into prominence with the arrest of Punjab Public Service Commission, chief Ravinderpal Singh Sidhu, who is constructing a house here. A scrutiny of the Cantonment records reveal that the controversial Masonic Lodge was registered way back in September 1902. It was later transferred to Mr Autar Singh Sekhon by virtue of a sale deed by a member, Narain Dutt, for Rs 16,000 vide a resolution of members of the lodge’s Triune Brotherhood on November 11, 1966. The records further show that the sale deed was made on August 2, 1972. The property was later transferred in the name of Sidhu by a will made by Mr Sekhon on November 20, 1990. However it is interesting to note that information of this mutation, made in the office of the Defence Estate Officer, Ambala, on October 20, 1990, was received at the Cantonment office here on November 5, 1999, after nine years. Board officials, when asked about the delay, stated they were informed about this change by the DO office at Ambala to make the necessary changes in their papers and the mutation took place at the Ambala office. The house, constructed after demolishing the Masonic Lodge here, has been in the midst of a controversy ever since its change of ownership as revealed by the records of the Cantonment Board here. While permission only to repair the damaged floor, roof and the walls was given by the board on August 18, 2000. Flagrant violations were made by Sidhu during construction. Consequently three show-cause notices were served on him for violations by the Cantonment Board on September 30, October 23 and November 3, 2000. The manner in which metal sheets were erected all along the parapet to conceal the curved road, where this construction was posing a traffic hazard, was first highlighted by this daily in December 2000. Thereafter the case was referred to the court which granted a stay on further construction after serving a notice. However this did not deter the PPSC chairman and construction went on at full swing. Finally two contempt cases were filed by the board on March 1 and June 6 last year against the ongoing construction, which remain pending. 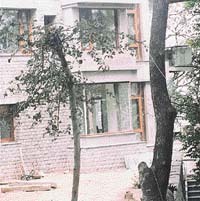 Ever since the arrest of PPSC Chairman discussions of this disputed property have become the hottest topic in town. People have been presenting doubts about the way the house was acquired by the PPSC Chairman. Old-timers recall that the house was once occupied by a bank employee. The community health financing scheme launched in the local Dean Dayal Hospital, where some non-government organisations had come forward to undertake specific maintenance works under the aegis of the Rogi Kalyan Samiti, has already started yielding results. There has been a vast improvement in the condition of various wards and the maintenance of buildings. The local voluntary organisations — Guru Nanak Sewa Society, Harsh Baljee Trust, Rotary Clubs of Vikasnagar and Midtown and the Sood Sabha — have adopted various wards of the hospital for two years. They have already incurred an expenditure of Rs 2.25 lakh and planned to spend another Rs 6 lakh for carrying out various works like repair and maintenance of toilets, annual paint and whitewashing, upkeep of furniture and replacement of electric fittings. Individuals have also come forward and donated about Rs 45,000 for upgrading the existing facilities. The Rogi Kalyan Samiti has with substantial participation from the Red Cross spent over Rs 6.5 lakh for providing new equipment to the hospital like phaco-emulsification machine and semi-auto analyser. It also undertook repairs of female surgical ward toilets, constructed a garbage chamber and renovated the laboratory building. The samiti has appealed to other non-government organisations and individuals to come forward and contribute in this noble task. He had died here yesterday following a brief illness. The minister of State for Horticulture, Mr Narendera Bragta, represented the state government at the cremation. A large number of people from all walks of life were present at the funeral. The PCC chief, Ms Vidya Stokes, the CLP leader, Mr Virbhadra Singh, a former Chief Minister, Thakur Ram Lal and many legislators were among those who went to Kumarsein to pay their last respects to the departed soul. Mr Sat Mahajan, former PCC chief, was also present. Mr Anand Sharma, a spokesman of the AICC, has expressed grief over the death of Mr Khachi whom he described as an outstanding parliamentarian. The Deputy Speaker, Mr Ram Dass Malangar, represented the Speaker, Thakur Gulab Singh at the cremation of Mr Khachi. In a condolence message, Thakur Gulab Singh said the contribution of Mr Khachi within the Assembly and outside was memorable. This was the seventh term of Mr Khachi in the Assembly. The Janata Dal (S) has mourned the death of Mr Khachi whom the party described as a true well-wisher of the hill people. The Sunni-Bhajji Development Society, the HP State Cooperative Development Federation and many other organisations have mourned the death of Mr Khachi. According to Mr Sanjay Kundu, SP, Kangra, it is the British High Commission, which informed the police about his disappearance two days ago. He said Kitchen along with other paragliders had taken off from Billing on April 7 at about 1.30 p.m. before the weather condition became worse. Mr Kundu said another paraglider, Mr Bruce Mills from New Zealand, informed the police that due to bad weather condition Kitchen’s paraglider might have been pushed to a higher altitude than usual and subsequently blown off, towards the Bara Bhangal area of Baijnath. This area lacks communication network and the terrain is inhospitable. Mr Mills told the police that seeing the inclement weather most of the pilots landed safely in the nearby areas. The police after being informed about Kitchen’s disappearance had dispatched search parties to the Bara Bhangal area and other higher reaches of the Dhauladhar ranges and sensitised the local panchayats to carry out search for the British national. The Chamba police has also been asked to carry out search in the Bharmour area, as there was a likelihood of the pilot crossing over and landing in Chamba. He has also requested the Chief Secretary to get an aerial recce done in the area. The Kulu police today seized 20 kg of charas from two foreign nationals who were moving suspiciously in the Patlikuhl area near Manali. A patrolling party deployed at a camping site got suspicious about the activities of Robert Williams and Ivor Ftelcher, both British nationals, and searched them. They were found to be in possession of 20 kg charas (10 kg each), in the shape of biscuits and concealed in polythene bags in several packets. According to Mr Venu Gopal, the SP, the foreigners had been visiting the Kulu-Manali valley frequently and had been indulging in smuggling of narcotics. A regular case under the Narcotic Drugs and Psychotropic Substances Act had been registered and the two accused had been apprehended. The college would now be called the National Institute of Technology. Mr Ravinder Ravi, Minister of State for Technical Education, chaired the meeting. Talking to reporters after the meeting at the college rest house this evening, Mr Ravi said the Centre had agreed to keep the admission of students on the old pattern —50 per cent from the state concerned and 50 per cent on all-India basis with nominations from other states. The Minister of State for Primary Education, Mr Karan Singh, said today that 4135 vacant posts of part-time water carrier in the primary schools would also be filled immediately. The SDM concerned had been asked to fill the vacancies at the gram panchayat level by July. According to the police, about 30 to 35 students marched to the site of the project and allegedly brought down the foundation stone using heavy boulders and iron rods. By the time the police arrived the structure had been raged to the ground. Mr Virender Kanwar, ASP, said a case had been registered against the office-bearers of the association, including Mr Sher Singh, Mr Kuldeep Bhardwaj and Mr Vijender Mehta. As many as 22 vultures of three endangered species were seen hovering over the carcass and sitting on a nearby pine tree.